A Belgian man, Chris, who was on the plane between Dominican Republic and Brussels, Belgium, explained not to worry. 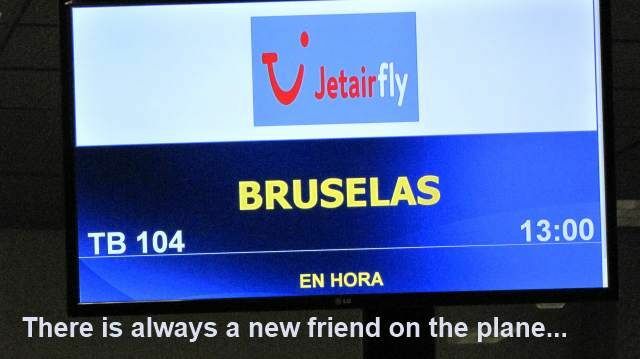 This is a story about the man who sat next to me on the plane between Santo Domingo, Dominican Republic, and Brussels, Belgium. … lived in Dominican Republic for years, married a girl, has a son, and speaks Spanish. On the plane, he was reading a book in Flemish, one of the languages of the Netherlands, aka Holland to Americans, but as I understand it, Brussels residents speak French. Chris lives close to Brussels. I met Chris in line at the JetAirFly.com check-in, where I asked him in French if most of the people in line were going to Belgium. He answered yes and answered many other questions as we spoke in French while standing in the Spanish-speaking Dominican Republic. He made wise, insightful comments about the USA and problems with debt in the USA. As we spoke in English on the plane, he was reading his book in Flemish. We both agreed that there are not many reasons to learn German. Only a couple of countries on the planet use the language; however, Chinese and Russian, or a little Arabic, would be helpful. But we agreed that learning Thai is a challenge. We also both agreed that with each new language we learn, we see and feel more of the world we live in. But in the end, he said, "Write for the people who want to listen. A few of us want to know more than others." Life is too short to make only money. It is better to make a life worth living.